Perfect symmetry. It's how we define beauty, but photography tends to shy away from it. Here are 19 pieces of proof that symmetry really is beautiful. When this challenge was announced, I knew exactly what I wanted to shoot. I've taken a lot pictures of this building, and even submitted one to a previous Shooting Challenge. This is Tampa's Rivergate Tower, known locally as "The Beer Can Building". 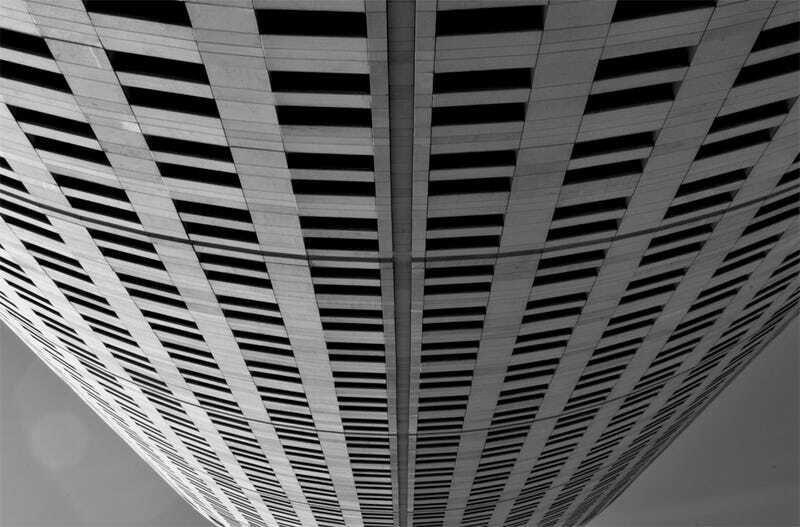 To get the inverted perspective, I took the shot laying down, looking straight up at the building. While the building is an exercise in symmetry, the individual pieces of the limestone facade have all become faded and stained to differing degrees. This adds a nice random effect to counter the symmetrical construction. I shot the picture in black and white on my Nikon D3100 set at 1/60 sec, f/29, ISO 100, with a 18 -55mm lens @ 50mm. In Photoshop CS5, I rotated the image 0.5 degrees, cropped the edges after rotating, and adjusted the exposure and contrast just a bit to make everything pop. Located at the Los Angeles County Museum of Art (LACMA), the "Levitated Mass" is a 340-ton hunk of granite. This sculpture is simple and powerful. One thing I loved most about walking under the rock was the lighting in the hall. Half of the hallway was illuminated, and the other in shadow. My favorite part is the line created from the bottom-left of the frame to the top-right. The shadows edge meets with the edge of the wall creating a line of symmetry. Held up to a ruler, it's a near perfect straight line. Shot with a Nikon D5100, 18mm, 1/1600sec, f/4, ISO 320. One of the most symmetric molecules is C60, also known as Fullerene or 'buckminsterfullerene'. It consists of 60 carbon atoms, arranged as 12 pentagons and 20 hexagons. There are 120 symmetry operations that can be performed on it. Once upon a time I built a model that still resides on the edge of my screen. I thought it was the perfect object to shoot for this challenge. My setup: Canon 5D with EF28-135mm at 65mm, 1/100sec, f/9. ISO 640, soft diffused light. Processed in LR4.4. Lights are Symmetrical! I found this out the hard way. After looking everywhere in nature for the past few days I found that it is indeed pretty hard to get what I was looking for in terms of "Symmetry". This doesn't really seem to be eye candy to me but it was really the best I could come up with since I haven't actually had much time lately. Shot with a Canon powershot sx260hs f/3.5 iso 200. Not much of a story behind it but I think it at least grasps symmetry very well. This is Saint Josephs cathedral in San Jose, CA. The symmetry is not perfect, but the detail is pretty cool. Canon T2i, f/3.5, 10mm, 1/30. I was shooting at Gay Parade Minneapolis, on a sunny clear day, when this kite caught my attention. It was flying randomly, held by someone dancing on the parade. I shot twice until ...one of those moments, the kite and the wind seemed just stand still a fraction of second lined up with the line of the building... one still can see the black wire... Camera: CANON G10, Lenses: 80mm, ISO: 100. Nikon D5100 with 18-55 zoom lens.shot at 18mm,post processing into B and W with silver effects pro and Adobe CS6. biological science building on the university of Arizona campus. When a friend calls at noon on a Friday to see if you want to go on a spur of the moment weekend trip to San Francisco, you just have to say yes. While walking with friends and waiting for our Tony's pizza to be ready, I saw this really cool church and instantly thought of the symmetry shooting challenge. The twin spires of the Saint's Peter and Paul Church jumped out of the cityscape and I knew there was a cool picture to be made. I originally thought that it would look cool as a silhouette, but it felt just wrong to cover up all that intricate detail, so I left in in there. I couldn't get the church exactly centered without there being a tree branch in the way, but I got pretty close. I used my Fuji X100 at f/4, 1/10, ISO-3200 to get the shot. I went hiking on Sugarloaf Mountain in Frederick, Maryland this weekend, and I figured I would look for some natural symmetry — pretty sure there will be many other webs in this gallery. I was hoping to find a basalt formation (they are here and there in my area), but no luck. It's a little washed out (late afternoon sun) but I really like the way 'ole "spidey" kept his kills in a nice straight line to ensure the maximum amount of web remained to take out more unsuspecting bugs flying by. Canon T5i Canon EF S18-135 STM lens. ISO 160/Auto. I took this shot while testing out my new ND filter. I used my Canon T1i, a kit lens, and my tripod. I set my aperture to f/4.5 with 1/40th sec exposure at ISO-200. I try to find subjects off the beaten path, but at times I felt like I was somewhere I wasn't supposed to be. I never saw any "No Trespassing" signs, so I took my shots and left. I wasn't very excited about this shot until I after I got it on my computer. Tweeked it a bit in Lightroom, and this is what I ended up with. I pass this bridge everyday on my drive to work and wondered what kind of photo it would make. I decided to go out and take a photo and ended up with a rather symmetrical shot shot when viewing down the bike path. Camera: Sony a77, Lens: Sony SAL1650, Aperture: f/8.0, ISO: 100. Bracketed Shots: -2/-1/0/+1/+2, Tripod: Three Legged Thing. Manually bracketed, wireless trigger and tripod mounted. Merged and tone mapped via Photomatix. Edited via Lightroom 4. Clarity, Contrast and Shadow settings increased. Highlights and a few luminosity settings reduced. I was in downtown NYC at the Empire State Building looking for symmetrical things to shoot. The building itself is perfect symmetry but as I was walking around in the lobby I came upon this behind the main desk in the lobby. The way the building is pictured with reflected rays around it made a better symmetrical picture. This was shot with my Canon 550D camera using a 50mm f1.4 lens. The aperture was 1/125 sec at f1.4 in aperture priority mode, evaluative metering and center weighted focus. I used a slow 100 ISO speed and shot the picture in RAW format. Converted to JPG with a little work in Canon’s DPP program. This is a simple smartphone shot (iPhone 5). I didn't have my SLR with me at the time and looking back, it doesn't look like I needed it. In case it's not obvious, the subject is an Alligator. The reflection comes from the underside of the water surface. Photoshop was used for cropping, sharpening and desaturation. I shot the photo at the Chihuly Garden and Glass in Seattle, an amazing place showing sculptures by the American artist Dale Chihuly. I felt like I was walking in a dream with some amazing setup for the sculptures. I was just having a good time walking around when I saw an opportunity for a symmetry photo, I could only take one shot because the security asked me politely to not place the camera in the glass holding the sculptures. After he said that, I wanted to take more photos so bad, but I had nothing else to do but just let it go and enjoy the rest of the exhibit. I used my Canon T4i at f8, 1/40sec ISO400 with a 18-200mm lens. I've always wanted to shoot the bridges from this vantage point but your symmetry challenge/assignment provided the perfect excuse! Long exposure with a solid tripod and shutter release trigger. Edited in Lightroom/Photoshop.Canon 6D with Tamron 10-24 wide angle at ISO 100 16mm f/10 32 secs. OK—I don't have a tripod. Or a level. Or a dedicated camera. I do have a camera on my phone, a chair, and a brick wall. Seemed like a good idea at the time. This picture was taken with the front camera on my HTC Droid DNA with standard automatic exposure settings (1/40 sec shutter, ISO-224, 4mm focal length, no flash). Owing to time and circumstance (and lack of tripod), I did end up using Paint.NET to lop off a small piece of the left side of the image. No other adjustments were made. This photo was taken while laying on the floor of the Jefferson Memorial in Washington DC looking up at the inside of the rotunda. I thought it was a cool shot the way that all the squares align perfectly and you really cannot tell if the squares get smaller or if it is an optical illusion as they get farther away from the camera. This was shot with my Nikon D5000 at f/4, 1/60sec. @ ISO 400. After spending most of the day walking around the city looking for pictures, I remembered I had some decorative filament bulbs laying around my apartment. I taped the socket cord to my kitchen wall, turned out the lights, and shot away! It was kinda tough getting it to stay at the right angle.Canon Rebel xsi, Canon 100mm f2.8 macro USM, ISO 200, F8, 1/100. This is a picture of a cell tower i took today at work using my point and shoot canon power shot A3100 IS. Ironically, I didn't know about the contest and i just took this pic thinking it would look cool, and that's the only camera I happened to have on me. The pic is unedited, just used the b/w setting on the camera. All other settings were auto. When you stare at symmetrical photos for too long, going back to the real world feels completely out of whack. Thanks for the strange sensation followed by an inevitable bout of depression. While I'm self-medicating, you can find the big shots on flickr.